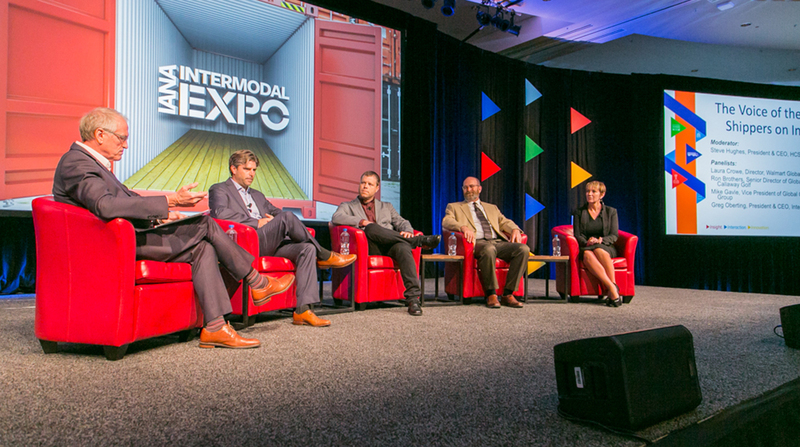 LONG BEACH, Calif. — Retailers speaking at the Intermodal Association of North America’s Intermodal Expo 2018 said they could move up product shipments due to tariffs being placed on China. President Donald Trump issued a statement Sept. 17 saying the United States would be placing additional tariffs on $200 billion of imports from China. The tariffs took effect Sept. 24 and will be set at a level of 10% until the end of the year. On Jan. 1, the tariffs will rise to 25%. Steve Hughes, CEO of HCS International, said one option for retailers is to get things shipped and landed by Jan 1. “I think December will be a difficult shipment season for everyone,” he said. Laura Crowe, senior director of global logistics for Walmart Inc., said it would be impossible to move all shipments ahead but will look at key items. “We would identify what could be affected by the tariffs, talk to suppliers, see if they can move up production and reissue the purchase order,” she said. Walmart coordinates with the U.S. drayage community and chassis providers 12 weeks before containers come in, so everyone would know what the volume will be and prepare, Crowe said. Bentonville, Ark.-based Walmart ranks No. 3 on the Transport Topics Top 100 list of the largest private carriers in North America. Callaway is a heavy user of intermodal, but Brothers said anything is on the table for the Carlsbad, Calif.-based retailer in terms of shifting capacity, shifting things early or moving capabilities around the world where it has a presence. However, Brothers and Crowe said they expect to maintain their current sourcing patterns for the time being. “I think short term, you’re going to keep shipping out of China. Like everybody else, we have to see how much of increased margin will Walmart absorb and how much will we pass on,” Crowe said. Callaway is not likely to decrease a supplier base in one part of the country in favor of another in the short term. “It isn’t that easy,” Brothers said, adding that the company has to look at where it might encourage suppliers to move. Interstate Commodities CEO Greg Oberting said he expects inventory levels in the United States to spike, which may make it harder to find warehouse space in the spring. Although the tariffs on Chinese imports will affect the retail landscape, Evan Armstrong, president of Armstrong & Associates, noted that the European Union is the United States’ largest trading partner. “China is our second largest,” he said. National Retail Federation CEO Matthew Shay said his group has spoken out against tariffs, explaining to attendees that tariffs get passed along to consumers.